Delimination of Life: Mark B. Hansen (us) about his new work on subjectivity and experience in the wake of contemporary media from transmediale on Vimeo. Poised on the cusp between phenomenology and materiality, media institute a theoretical oscillation that promises to displace the empirical-transcendental divide that has structured western meditation on thinking, including the thinking of technics. Because media give the infrastructure conditioning thought without ceasing to be empirical (i.e. without functioning as a transcendental condition), they form the basis for a complex hermeneutics that cannot avoid the task of accounting for its unthematizable infrastructural condition. Tracing the oscillation constitutive of such a hermeneutics as it serves variously to constitute media theory in the work of critics from McLuhan to Kittler, from Leroi-Gourhan to Stiegler, my interrogation ultimately conceptualizes the medium as an environment for life: by giving concrete form to ‘epiphylogenesis’ (the exteriorization of human evolution), concrete media find their most ‘originary’ function not as artifacts but via their participation in human technogenesis (our co-evolution with technics). Hansen’s reconceptualization of media has been a key point of reference in my own attempts to theorize the ecology of “postnaturalism,” which turns on the notion of a constantly evolving “anthropotechnical interface.” One of the things that I tried to do in my engagement with Hansen’s thought was to expand it and to push the notion of media as environment beyond the qualification “for life,” arguing that media constitute the environment for agency in a broader sense, both living and non-living. One could say, in fact, that this is equivalent to saying that media constitute the environment period. And, interestingly, in the video above (from the transmediale 2011), we find Hansen working towards precisely this type of expanded approach: a non-anthropocentric, non-biocentric, positively cosmological notion of media. 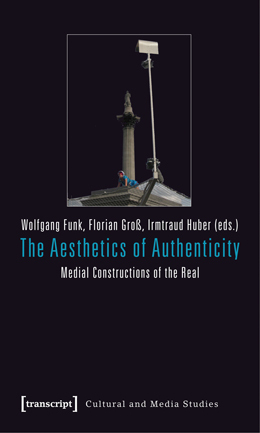 “As a concept that increasingly gains importance in contemporary cultural discourse, authenticity emerges as a site of tearing tensions between the fictional and the real, original and fake, margin and centre, the same and the other. In a sense, though, the temptation to describe the implications of that study (summarized in the video above) as a demonstration that “baboons can read” is just another iteration of a familiar tendency to anthropomorphize nonhuman primates rather than to draw the converse and much more interesting sorts of conclusions suggested by observing these animals’ behavior: Rather than humanizing apes, I suggest, we should be led by studies like this one to relax our anthropocentric perspectives and to appreciate the nonhuman aspects of those activities and skills, such as language-use, that are typically seen to distinguish us most centrally as human. While the implications of the experiment shown here are interesting from a wide variety of scientific and philosophical perspectives, they are of especial interest from a media-theoretical perspective, especially one (like mine) that’s interested in pre-, sub-, or non-discursive interactions between bodies and things. The study was intended less to probe animal intelligence than to explore how a brain might learn to read. It suggests that, contrary to prevailing theory, a brain can take the first steps toward reading without having language, since baboons don’t. “Their results suggest that the basic biological mechanisms required for reading have deeper evolutionary roots than anyone thought,” said neuroscientist Michael Platt of Duke University, who co-authored an analysis of the study. “That suggests that reading draws on much older neurological mechanisms” and that apes or monkeys are the place to look for them. Reading has long puzzled neuroscientists. Once some humans started doing it (about 5,000 years ago in the Middle East), reading spread across the ancient world so quickly that it cannot have required genetic changes and entirely new brain circuitry. Those don’t evolve quickly enough. Instead, its rapid spread suggests that reading co-opted existing neural structures. Dr Grainger [one of the scientists responsible for the study] told BBC Nature that recognising letter sequences – previously considered a fundamental “building block” of language – could be related to a more simple skill. “The baboons use information about letters and the relations between letters in order to perform our task… This is based on a very basic ability to identify everyday objects in the environment,” he said. Of course, it’s not like this settles things, but it does suggest some interesting correlations between eyes, hands, and objects — embodied, techno-material correlations of a straightforwardly nonhuman sort — that would seem to be basic to the constitution of discursive (human) subjectivities, and not vice versa. Thus, rather than bringing the apes into the citadel of humanity, perhaps we should let them lead us out of the prison-house of language! 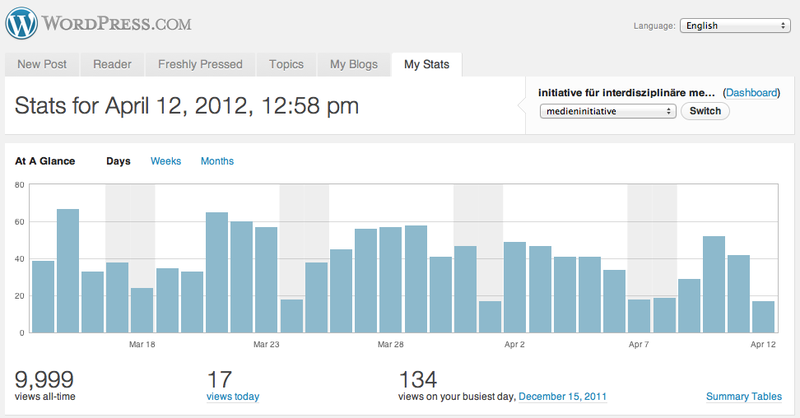 10,000: As of today, the number of page views on this blog since its inception in May 2011. Today, sometime between 1:00 and 3:30 p.m., this blog had its 10,000th page view, when a visitor from either Spain, Canada, or Germany (in which case it was very possibly my wife) clicked on this site, either deliberately or (as I’m told happens occasionally on the interwebs) by chance. Admittedly, 10,000 hits over the course of 11 months is not a whole lot in comparison with the kind of traffic that corporate sites, media outlets, universities, or even some of the more popular academic bloggers get, but it’s nevertheless not an altogether insignificant milestone for a fledgling media initiative at a German university posting largely on local events, niche-interest topics like seriality or posthumanism, or whatever happens to interest me at the time. I thought I’d take the opportunity, therefore, to review and take stock of things. Luckily, WordPress provides a range of interesting statistics that are perfect for this kind of occasion. To start with, 122 posts (this one included) have been made since I set up the blog on May 5, 2011. There were only 2 visitors to the blog that May (I didn’t go public with the blog until June, so who knows what led those two poor souls here then), roughly 200 hits in June, and since November 2011 the blog’s been averaging about 1500 monthly page views. The five most popular pages have been: 1. the main landing page (4,668 hits), 2. Conference Program: “Cultural Distinctions Remediated” (detailing the conference we held here in December 2011; 366 hits), 3. the About page (235 hits), 4. 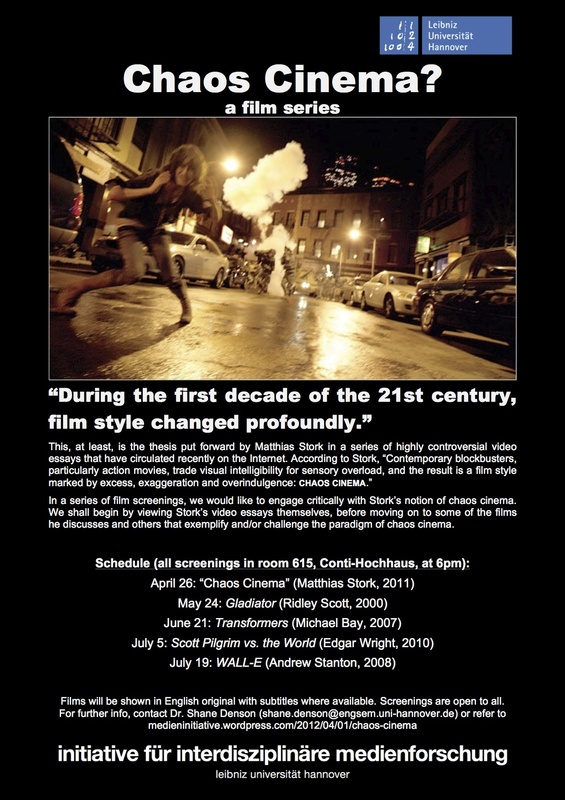 Bollywood Nation (our film series in the winter semester 2011/2012; 188 hits), and 5. Bollywood Nation: Background / Context (likewise 188 hits). Most people arrive here by way of a search engine (4,260 referrals total, including 3,329 from Google Image Search, 838 from “normal” Google searches, 28 from Bing, and a handful of others). There have also been 485 referrals from Facebook, 279 from Twitter, 259 from the English department at the Leibniz Universität Hannover, 93 from Jason Mittell’s blog Just TV, 93 from the homepage of the Popular Seriality research group, and lately an increasing number of referrals from Jussi Parikka’s Machinology blog, Steven Shaviro’s The Pinocchio Theory, Dylan Trigg’s Side Effects, and Bernard Dionysus Geogehan’s homepage. And finally, WordPress has recently started providing statistics on the countries where the blog’s visitors (or at least their IP addresses) are located. Statistics are only available since February 25, but since then the top five countries have been: 1. United States (454 hits), 2. Germany (437), 3. United Kingdom and Canada (tied at 177 each), 4. India (103), and 5. Australia (69). So that’s where we’ve been, but where is the blog heading? What does the future hold? To be sure, only time will tell, but a number of things are in the works right now: the Media Initiative continues to develop, and a number of media-related events are being planned in Hannover (and elsewhere), so be on the lookout, and consider subscribing to the blog via e-mail (you can sign up on the right), an RSS reader of your choice, or your WordPress account, for example. Additionally, spread the word via your favorite social network, blog, or other modern mode of communicative being. And if that’s not enough, don’t forget: we’ve got plenty of cheezburgers, traffic, and metabolism for all your spambots!